Recently on Roadtrip-'62 ™, I discussed some points of interest along highway US-202 in Delaware. As that route number is a so-called “child” route of US-2, I decided to look at US-2 today. And because many of the most scenic places in the country are our National Parks and other National lands, I’m going to look at what locations we could have seen in 1962 along US-2. The route meets the previously discussed US-202 in Bangor, Maine, so let’s begin there. Route US-2 is an oddity among the US-numbered routes, as it is split in two parts. The eastern part runs 460 miles through Maine, New Hampshire, Vermont, and ends in the northeast corner of New York. The western part began in Sault Ste. Marie, Michigan in 1962 and ran 2200 miles west to Everett, Washington. This section was shortened in 1984 and now runs only from St. Ignace, Michigan west. In between these sections is Canada, hence the disconnection. Neither of my roadtrips cross this road, but the US-23 trip gets close. We can just see it across the Straits of Mackinac from the very beginning of US-23 in Mackinaw City, Michigan. While not technically National Parks, our National Forests, National Grasslands, and National Wildlife Refuges provide many of the same scenic and recreational opportunities, so I will consider them also. Additionally, National Historic Sites are administered by the National Parks Service, so I will consider them in this discussion. That makes for about 30 sites along or near US-2, so let’s get busy. Heading west from Bangor, the only location completely within Maine is Sunkhaze Meadows National Wildlife Refuge, near Milford. The refuge was established in 1988 to help protect the ancient Sunkhaze Meadows peat bog. It is the second-largest and most unusual peatland in Maine, containing several raised bogs or domes, streamside meadows, cedar swamps, and red and silver maple floodplains. Near here, US-2 travels near the 45th parallel, the line halfway between the equator and the north pole. Peat bogs, which are remnants of the last Ice Age, are common along this line and to the north. In fact, we will see a lot of evidence of the glaciers of the last Ice Age along US-2, the most northerly of the transcontinental US-numbered routes. 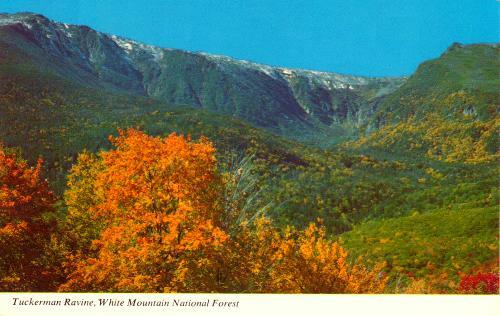 We would have been able to see the next site, White Mountain National Forest, in 1962. White Mountain National Forest straddles the border of Maine and New Hampshire on the south side of US-2 and continues west nearly across the entire state of New Hampshire. This and most other National Forests that we will pass through were established in the early 1900s after commercial logging had decimated the original forests. The Weeks Act, passed by Congress in 1911, appropriated $9 million to purchase 6 million acres of land in the Eastern U.S. White Mountain National Forest was created as part of that effort in 1918. Over time, the forest has grown from 7,000 to almost 800,000 acres and now comprises 23 campgrounds, scenic overlooks, picnic areas, hiking trails, boat launches, waterfalls, and more. The author, only 1972 miles from Maine on the Appalachian Trail, Newfound Gap, Tennessee. We cross a linear recreation site in New Hampshire, the Appalachian National Scenic Trail. Some people might not think of a trail as a National Park, but it is administered by the National Park Service and is largely on federal lands. We cross the trail at Headmine State Forest, near Shelburne, New Hampshire. This hiking trail is more than 2,175 miles long, extending from Maine to Georgia. It was conceived in 1921 and first completed in 1937. We could have walked the whole trail or just this part back in 1962. It’s used for everything from short walks, to day hikes, to long-distance backpacking journeys, and offers spectacular scenery along the spine of the Appalachian Mountains. On its way, the Appalachian National Scenic Trail passes through more than 75 different federal and state forests and other park lands. Next up, in Vermont, is Missisquoi National Wildlife Refuge. It was established in 1943 to provide habitat for migratory birds and includes the Maquam Bog. The refuge offers varied wetland habitats that are home to over 200 species of birds including nesting bald eagles, osprey, and a great blue heron colony. The fall migration features 20,000-25,000 migrating ducks alone! Route US-2 does not see enough of New York to find any sites to visit, as it leaves the United States near Champlain. To complete the route, you need to drive about 656 miles, mostly on the Trans-Canada Highway, to reenter at Sault Ste. Marie, Michigan. Since the Trans-Canada Highway was completed in 1962, with the final link at Rogers Pass between British Columbia and Alberta, that seems very appropriate. So, coming back onto US-2 at Sault Ste. Marie, Michigan, we come to an unusual recreation site. One would not usually think of dams or shipping locks as recreation sites, but I like to think of the Soo Locks as one. Since the first lock opened in the 1850s, people have come to watch ships passing through and by the 1880s, a public park with strolling paths, benches, and a fountain had been constructed alongside the canal. Within the park, an observation platform alongside the MacArthur Lock was built, which still stands. This provides great views of boats in the locks and now has wheelchairs and stroller access. The US Army Corps of Engineers built a visitor center in 1966, so we could not have stopped in there. However, we could have taken a boat tour through the locks! There has been a private tour operator offering these trips since 1934. We next travel through the Hiawatha National Forest to St. Ignace, Michigan. This forest has shorelines on three of the five Great Lakes: Superior, Huron, and Michigan. The forest is in two separate sections, with the eastern part originally designated as Marquette National Forest in 1909. It was administered with the Huron National Forest in southern Michigan as the Michigan National Forest from 1918 until 1962, when it was joined with the western part already known as Hiawatha National Forest. Because it includes lake shoreline, it includes some lighthouses, such as the Point Iroquois Light. This lighthouse occupies a point on Lake Superior and is operated as a museum. It was deactivated in 1962 and replaced by automated signals nearer the Soo Locks. The forest’s 1 million acres also surround five National Wild & Scenic Rivers, so if you’re interested in canoeing or kayaking, this is the place for you. I’ve camped on the shores of both Lake Superior and Lake Michigan and enjoyed the isolation. The North Country National Scenic Trail also runs through the forest and we cross it twice in Michigan, once in the forest near St. Ignace, and once in the Ottawa National Forest near Iron Mountain, Michigan. We then cross the trail twice again in Minnesota, near Duluth and Grand Rapids. When completed, this trail will be the longest continuous hiking trail in the United States. It runs from Crown Point, New York, to Lake Sakakawea State Park, on the Missouri River, in North Dakota, where it joins the Lewis and Clark National Historic Trail. The North Country National Scenic Trail meanders through 7 states, which is why we can cross it so many times. Coming as no surprise, it also crosses both our US-23 and US-6 roadtrips. This trail is too new for our roadtrips, though, as it was only established as a component of the National Trails System in 1980. At St. Ignace, we also find the Father Marquette National Memorial. The memorial honors and tells the story of Father Marquette, a French explorer and missionary whose travels proved that the middle of the North American continent could be colonized by Europeans. On a site in Straits State Park, established in 1924, the memorial tells his story and that of the meeting of French and Native American cultures in the North American wilderness. The memorial consists of a building and trail with signs, and overlooks the Straits of Mackinac. Father Marquette died in 1675 in present-day Ludington, Michigan and was originally buried there. His followers later moved his body to the chapel of the mission he established at St. Ignace, located at State and Marquette streets. Continuing west through the western section of Hiawatha National Forest, we next come to Ottawa National Forest, also in Michigan. Portions of the Ottawa National Forest receive over 200 inches of snow annually! Of course, this makes for great skiing, both Alpine and Nordic, great snowmobiling, dog-sledding, and ice fishing over the winter. The forest includes over 50,000 acres in three different wilderness areas, but also includes easily accessible campgrounds. Many waterfalls are within the forest and though most are somewhat difficult to find, the Black River Drive near Ironwood Michigan has a wonderful road that parallels the Black River and reveals its waterfalls right along the road. Ottawa National Forest was established in 1931 and though this 12-mile road was not dedicated until 1992, the falls were here long before. They are my favorite place in the forest. Wisconsin also has a national forest, Chequamegon-Nicolet National Forest. In common with many other federal and state park and forest land, many facilities were originally constructed by the Civilian Conservation Corps (CCC) during the 1930s on land that was heavily logged, burned over, and abandoned. There are buildings, bridges, tree plantations, former campsites and fire towers built by the CCC. Some of the sites are still in use, while others have been reconstructed or demolished or removed. In addition to the usual recreational opportunities of the national forests, Chequamegon-Nicolet includes Argonne Experimental Forest. This experimental forest was established in 1947 and hosts experiments of management techniques such as cutting schedules for northern hardwood forests. Vegetation types vary according to the soil type, allowing experiments on a wide variety of species. Most stands of trees are second-growth and even-aged, though there are small areas of old-growth northern hardwoods on the forest. The Chippewa National Forest in Minnesota is the first National Forest established east of the Mississippi River. It was established in 1908 and includes more lakes and wetlands than any other National Forest. The forest was originally known as the Minnesota National Forest but the name was changed in 1928 to honor the original inhabitants of the area. The Leech Lake Indian Reservation is also within the Forest boundary, as are over 3000 archeological and historic sites. 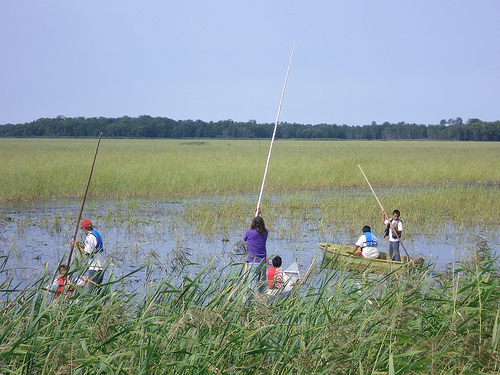 The Leech Lake Band of Ojibwe offers visitors a chance to experience Anishinabe culture and learn about the past from prehistory. Chippewa National Forest is one of the largest breeding areas of bald eagles in the lower 48 states and eagles can often be viewed soaring over the lakes. Minnesota contains two National Wildlife Refuges, Rydell National Wildlife Refuge and Glacial Ridge National Wildlife Refuge. Rydell is a latecomer to the system, established in 1992. Rydell represents just about the most westerly of the northern forest and wetland habitat we have been driving through since Maine. Beyond here, we enter the prairie. This location at the intersection of the two landforms meant that people tried to practice typical prairie farming techniques here: at least 19 farmsteads, many of them log structures, were once located on the refuge. One, the Strom Building, has been protected under a canopy and is accessible from the 7-mile trail system. Glacial Ridge National Wildlife Refuge is farther west in Minnesota and is the largest prairie-wetland restoration in the United States. It offers some spectacular wildlife viewing opportunities right from the road, where you can see waterfowl, swans, and sandhill cranes. Glacial Ridge National Wildlife Refuge is even newer than Rydell, having been established in 2004. North Dakota has more national land sites than we’ve seen in other states along US-2 so far. But because quite a lot of the land out west is still federally owned, we will see a higher concentration of sites the rest of the journey. In North Dakota, there are Devil’s Lake National Wildlife Refuge, Lake Alice National Wildlife Refuge, and Sully’s Hill National Game Preserve. While the two National Wildlife Refuges are similar to others we have seen, Sully’s Hill National Game Preserve is something different. The refuge was first established in 1904 as a national park but was re-designated by Congress as a big game preserve in 1914. It has an active buffalo herd on its mixed-grass prairie. It was transferred to the U.S. Fish and Wildlife Service in 1931 and its mission as a refuge was expanded to include breeding grounds for migratory birds and wildlife. Overlooking North Dakota's largest natural lake, Sully’s Hill National Game Preserve offers spectacular views along with wildlife viewing. Well, there are so many more sites to see that I’m going to save them for another day. We haven’t seen an actual National Park yet, but there is one down the road. So, we’ll finish the Great Plains and head into the Rocky Mountains next time on Roadtrip-'62 ™!